Good Luck! Second years are off to their Internships! Our second years have fledged the nest and are out in the world doing their internships. 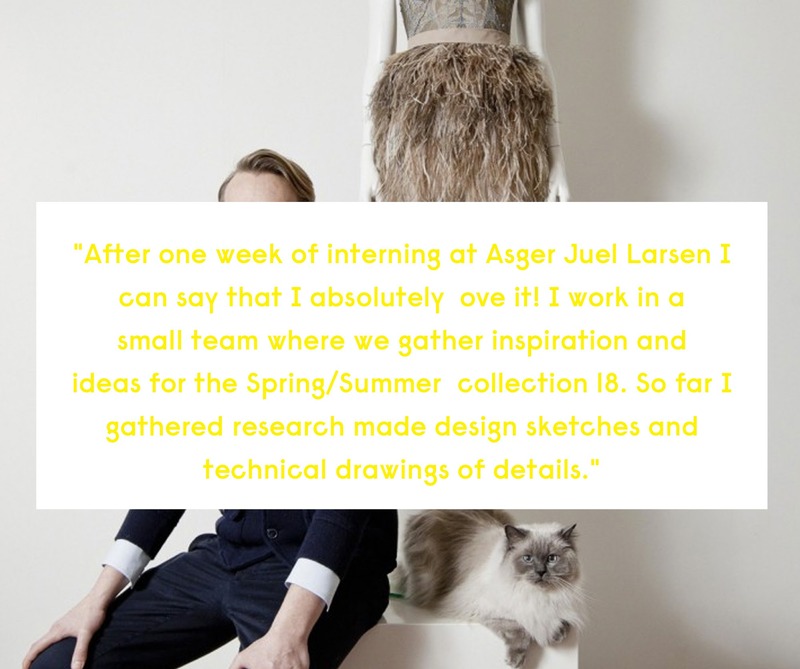 We are proud that they are able to spend time learning their trade with such big names as Anecdote, Claes Iversen, Asger Juel Larsen and Mason Garments. A great experience that will not only look great on their C.V. but is a big towards their future careers in the fashion industry. We wish them an instructive, inspiring and wonderful time. Alexandra Hingsen will be moving to the USA, Santa Monica where she will be working with the loungewear brand Lunya within the marketing and ecommerce department. Karien Oude Wolbers is completing her internship at Anecdote, working alongside their marketing department, she has already seen some of her moving image work in the centre of Amsterdam Rembrandtplein on the large screen. Melissa Roksnoer will be traveling to Spain Barcelona to complete her internship for Production Media Network S.L within the Model Management group, where she will working under the marketing and management department in particular within the ecommerce environment. Amanda Leimand Michelsen has gone back to her routes and will be from the end of March working with Danish womenswear designer Claes Iversen. She will be working alongside the design team in the development of technical trials, helping with the production fitting with the RTW and making adaptions, assisting on the photoshoots and shows. Linda Dittrich is leaving the Netherlands to complete her internship in Copenhagen with menswear designer Asger Juel Larsen. She will be working alongside the design department helping to develop and support the current collection. Valerie Vastesaeger is working in Belgium, Antwerp with the brand Essentiel and is completing an internship as retail project coordinator, part of her role is stock analysis, maintaining brand identity within the store and she is learning new industry software which includes; avision.